In 1493, Ponce de León sailed with Christopher Columbus on Columbus' second voyage to the Americas. He and his family settled on an island in the Caribbean named Hispaniola (Dominican Republic). He became a military commander at this post and was appointed deputy governor. In 1506, Ponce de León discovered a nearby island named Borinquen. While there, he found large deposits of gold. Soon after his discovery, he left the island. He returned in 1508 on orders from the king of Spain to explore and colonize the island. He renamed the island Puerto Rico. He was the island's governor for two years until the king replaced him with Columbus' son. Ponce De Leon led the first European expedition to Florida. Florida was first seen by Ponce de Leon on Palm Sunday on April 2, 1513 - he then named the "Pascua de Florida," meaning "Feast of Flowers" and claimed it for Spain. Ponce De Leon is associated with the legend of the Fountain of Youth, also reputed to be in Florida. 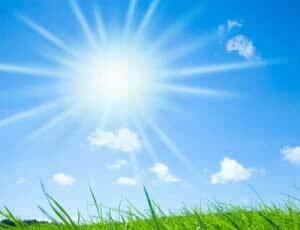 Florida's nickname is The Sunshine State, and it was adopted officially by Florida legislature in 1970. 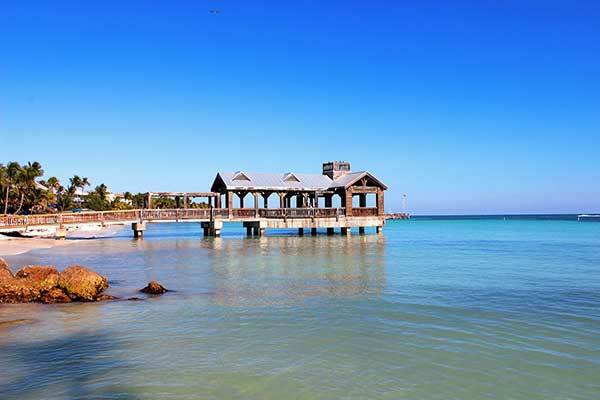 Florida is the fourth most-populated state in the country, and it's beautiful sandy beaches and warm climate draw thousands of tourists every year. Stephen C. Foster, one of America's Best-loved musical storytellers, wrote "The Swanee River (Old Folks at Home)" in 1851. Since 1935 it's been Florida's song. A memorial center at White Springs honors Foster, who authored about 200 songs during his prolific career. 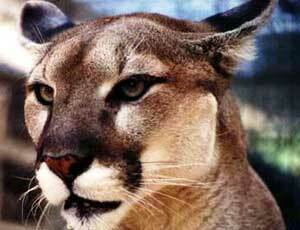 Also know as Cougar, Puma, Mountain Lion, Panther, or Catamount. On Average, Cougars have a life span of about 8 years. There are many subspecies of cougar. Cougars are an endangered species due to loss of habitat and over-hunting by man. 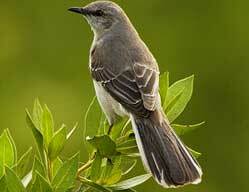 The mockingbird was adopted as the Florida state bird April 23, 1927. It is a common songbird that will mimick the song patterns from other birds, insects, and amphibians. The mockingbird is from 9 to 11", and is mostly gray, with large white patches on the wings and tail. Dolphins live in small groups of up to 12 members, and these groups are called pods. 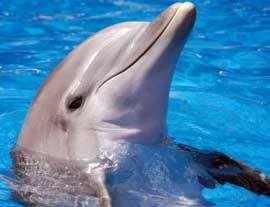 Bottlenose dolphins can live to the age of thirty and most are six- to eight-feet in length. Dolphins use a system of echolocation, much like sonar, to determine their orientation. The average adult manatee grows to be about 10-12 feet long and weighs about 1,000-1,800 pounds. The manatee's life span is roughly 60 years. 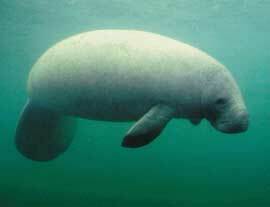 Manatees are endangered, the most-common cause of death for manatees is being struck by boats. 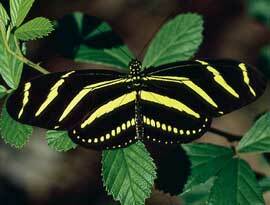 The adult Zebra Longwing is mostly black with yellow stripes and spots. The adult has a 2 - 4 inch wingspan. Adults sip sweet nectar and pollen from lantana and shepherd's needle. The Zebra Longwing butterfly makes a creaking sound when it is alarmed. The Sailfish name originates from the greatly enlarged first dorsal fin that runs almost the length of its back and is covered with spots. 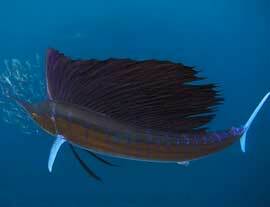 The sailfish can reach speeds of sixty m.p.h. 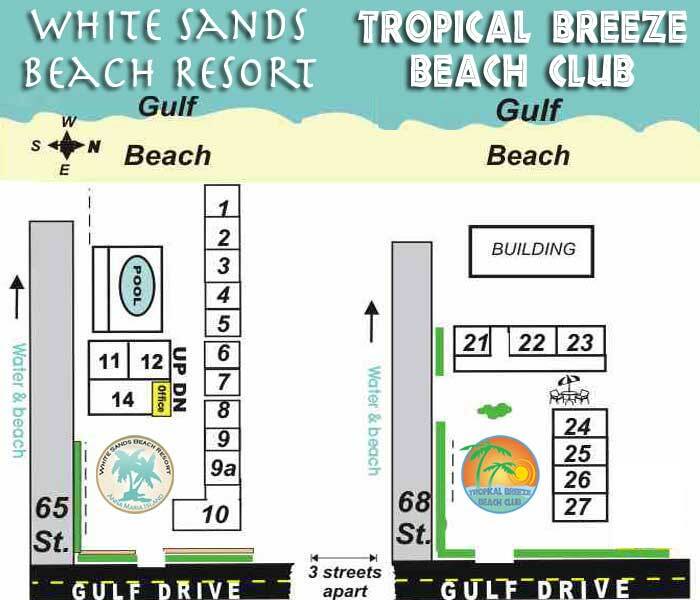 Sailfish found in Florida are approximately six to seven feet and thirty to forty-five pounds. Alligators are large, meat-eating reptiles that spend a lot of their lives in the water. 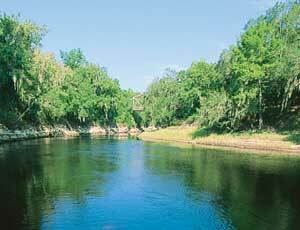 They mostly live in fresh to brackish water, and found in swamps, marshes, canals, and lakes. 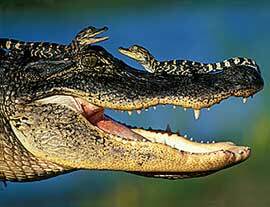 The American alligator grows up to 19 feet long, weighing up to 1000 pounds. 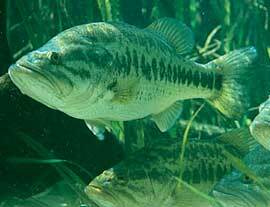 The Florida largemouth bass (Micropterus salmoides floridamus) was designated the official state freshwater fish in 1975. This black bass (an elongated sunfish) lives in quiet, vegetation-rich Florida waters and can grow to over 20 inches and over 15lbs. 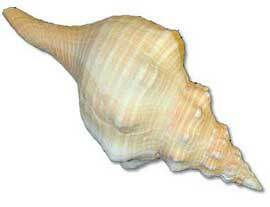 Florida designated the horse conch (Pleuroploca gigantea) as the official state shell in 1969. Also known as the giant band shell, the horse conch shell can grow to a length of twenty-four inches and is native to the marine waters around Florida. The orange blossom was designated State Flower by Concurrent Resolution Nov. 15, 1909 Legislature. It is one of the most fragrant flowers in Florida. 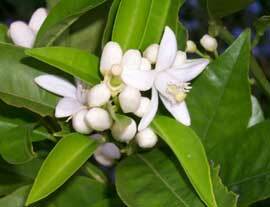 Millions of white flowers perfume the atmosphere throughout Florida during orange blossom time. 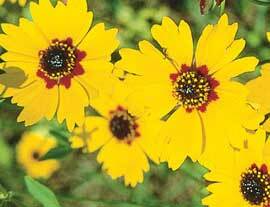 Florida designated coreopsis as the official state wildflower in 1991. Coreopsis ranges in color from golden to pink and has been planted extensively in Florida for highway beautification programs. Coreopsis, and some varieties are also referred to as tickseed..
Florida designated the sabal palm as the official state tree in 1953. The palm tree, is the emblem of victory, justice and honor. 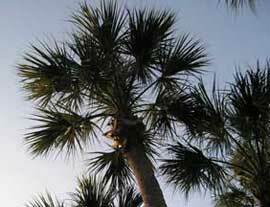 The palm is also known as cabbage palm, palmetto, or cabbage palmetto, is the most widely distributed palm tree in Florida. 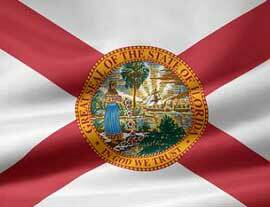 Florida's official flag was adopted in 1900. Florida's flag has a red cross of St. Andrew on a white field; in the center is the state seal, which depicts a woman scattering flowers, the sun with many rays, palm trees, a sailing steamboat, the land and the water.